Welcome to South Pacific gem Taveuni in Fiji. It won’t make the brochures, but on Taveuni I had my first chance to sample coral sperm. In a tiny hut beside Taveuni’s huge rainforest, villagers allowed me to eat their greatest delicacy – only available once a year when coral releases egg and sperm bundles simultaneously. This is the type of cultural event you’ll likely stumble across on Fiji’s third largest island – the prettiest of its 333. Dubbed the Garden Island of Fiji, it’s home to one of the world’s most undisturbed island habitats, mostly in the vast Bouma National Heritage Park. 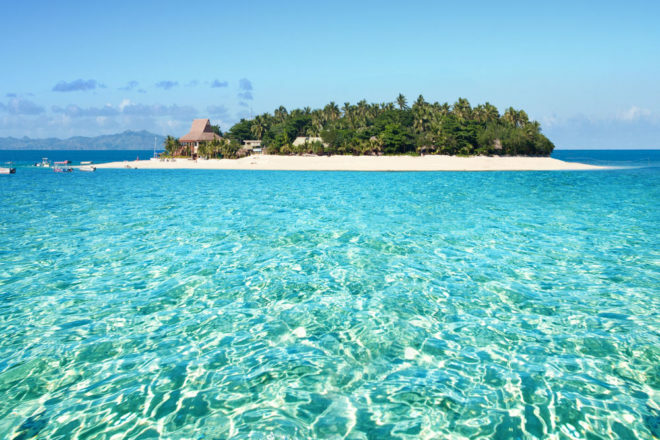 Only around 9000 people live on this gigantic island, but it’s the Fiji you won’t see on Viti Levu; there’s almost no development with locals reliant mostly on the copra trade. You’d think all this might be days away from Nadi, but it only takes around 80 minutes to fly here. While mostly nature lovers venture here, Taveuni is made for couples. Some of Fiji’s classiest high-end properties straddle the lagoon, while the off-shore reefs provide some of Fiji’s best snorkelling and diving options. There are also coastal walks, empty beaches, soaring mountain ranges and Fiji’s best waterfalls hidden deep within the Bouma National Heritage Park. Northern Fiji experiences high humidity and heavy rainfall over summer. Best to go between May and October.